Provide comfort for the family of Dorris Johnston with a meaningful gesture of sympathy. 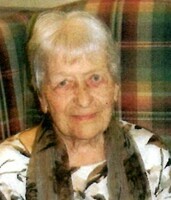 Dorris H. (Hempstead) Johnston, 87, of 280 High Street, Westerly, passed away at the Westerly Health Center on Monday, April 8, 2019. She was the wife of the late Carl R. Johnston, Sr.
Born in Stonington, she was the daughter of the late Clarence and Elizabeth Hempstead. Dorris worked as a clerk for Electric Boat in Groton for many years. She is survived by four children, Carl R. Johnston, Jr. and wife Ann of North Stonington, CT, Chris R. Johnston and wife Sandy of Hope Valley, Caryn R. Malaghan and husband Terry of Westerly, and Chira R. Johnston-Gallo of Hawaii. Dorris also leaves ten grandchildren; and five great grandchildren. To plant a memorial tree in honor of Dorris H. Johnston (Hempstead), please visit our Heartfelt Sympathies Store. We encourage you to share your most beloved memories of Dorris here, so that the family and other loved ones can always see it. You can upload cherished photographs, or share your favorite stories, and can even comment on those shared by others.